Shoes have been my nemesis for most of my life. at age 12, I was wearing a women's size 12 shoe. Today, I wear a size 13! 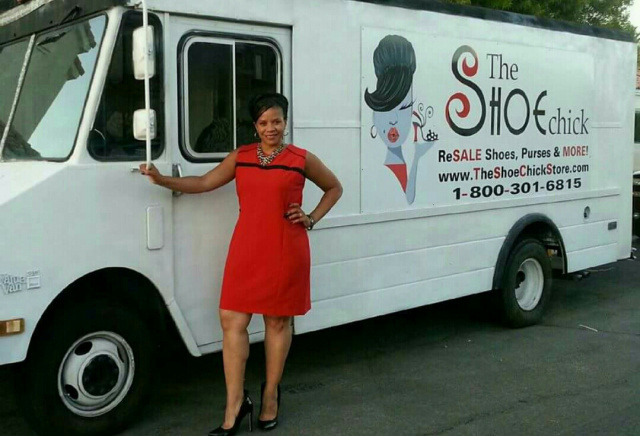 In 2013, I bought an old UPS truck and with a BIG vision and the help of two good friends (shout out to Andre Hines and Brian Martin) we tranformed it into a MOBILE STORE. For some reason, I was feeling somewhat accomplished but still unfulfilled. From time to time, I would have fleeting thoughts to paint portraits of shoes with motivational quotes (SHOE-ISMs). This time a sense of urgency accompanied the thought. Although I had never painted before, in October 2014, I began to paint. I showed my dear friend and mentor the renowned African American Artist, Annie Lee and she loved my work! The next day Annie was hospitalized and within ONE WEEK she passed away. Annie is my Guardian Angel that is giving me the courage to follow my passion and the courage to share my work with you. Today, I have an ART STUDIO in downtown Las Vegas where I host paint parties, create more Art and it's also where you can see my "SHOE PAINTINGS". I also have partnered with LIFE TODAY, a Christian non-profit organization, and I am helping kids in AFRICA get shoes by donating EVERY month....and YOU are too when you paint or purchase MY ART!